Joseph Stalin Long real name and not easy to remember: Iosif Vissarionovich Dzugashvili. The world knew him by Joseph Stalin, the dictator so many years of Soviet proletariat. Born in 1879 in the city of Gori, Georgia in the Caucasus and Georgia native language too, which is far different from Russian. Only recently learned the Russian language, but every way, accent Georgianya never disappeared. He grew up in a poor papa. His father's shoe sole artisan who like his son to drinking and beat twist. This drunkard father died when he was eleven years old Iosif. As a young Iosif learned in church school in Gori and after stepping on teens he entered the theological seminary in Tiflis. However, in 1899 he was kicked out of seminary for allegedly "spreading subversive thoughts." Then join it with a Marxist underground movement, and in 1903, when there are divisions within the party, he sided with the Bolsheviks. Until 1917 he was a staunch party members and enterprising, held no less than six times. (But generally not severe punishment befell him. More than once he tried to escape from custody. There are allegations, there was a brief period where he was actually a double agent). At this time that he began to use a pseudonym is delicious and fit: Stalin, the man who is made of steel. Stalin did not hold a crucial role in the revolution of 1917. But, she is very active within the next two years, and in 1922 he became General Secretary of the Communist Party. The position is wide open opportunity for him to exert influence on the course of the administration party and is a major factor in the struggle to the summit of power after Lenin died. Clearly, Lenin's successor likely to Leon Trotsky. In fact, in his political testament Lenin insisted that Stalin was too harsh and should be removed from the position of Secretary General of the party. However, after Lenin's nothing at the beginning of 1924, Stalin replaced Lenin's testament as he hides. Furthermore, Stalin managed to join forces with Lev Kamenev and Grigori Zinoviev, two important members of the politburo, and form a troika or a triumvirate. Together they managed to defeat Trotsky and his followers. Then Stalin - a genius in terms of shear-shifting fight in groups - turning to Zinoviev and Kamenev and get rid of them both. After successfully defeating the "left-wing opposition" (eg: Trotsky, Kamenev, Zinoviev and followers) in a power struggle, Stalin continued to receive some of their political proposals. Shortly thereafter, Stalin faced a "right wing" of the Communist party - his temporary ally - and beat them anyway. By the early 1930's, he had become sole dictator of the Soviet Union. From this powerful position, starting in 1934, Stalin launched a series of cleanup. Events that could be considered at least the beginning of the cleanup action is murder that occurred on December 1, 1934 upon Sergei Kirov, a high official of the Communist and one of Stalin's adviser. Most likely, Stalin himself who ordered the killing, partly to get rid of Kirov, but it seems more intended to hide the cleaning steps further. Subsequent years, a large number of people who had become leader of the Communist party leadership in the revolution of 1917, and those who were under the rule of Lenin, Stalin accused and convicted traitor. Many of those who make open confession in front of people's courts. This is similar to Thomas Jefferson for example, when the so-President, capturing most of the signers of the Declaration of Independence and punish them after they "confessed" in front of the general court. In 1938, the man who headed the beginning of the release step, Genrikh Yagoda, also brought to court, claiming to have been betrayed and executed immediately. Nicolai also Yehzov replacement suffered a similar fate. Cleaning in the middle of the 1930s, extends to the whole body of the Communist Party and the Armed Forces, and cleaning it is not primarily addressed to the problem of anti-Communist and counterrevolutionary. 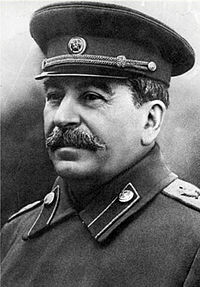 Stalin killed more successful in terms of the Communists rather than by the police Czar himself. For example, members of the Central Committee of the Communist Party who was elected in 1934, more than two-thirds were killed during the next cleaning. Of these measures is clear, Stalin's main motive is to open up the possibility of him setting up an independent force in the country. Ironically, just when this is the great-great Stalin's purge of the Soviet Union issued a new constitution called democratic. Among the confirmed Stalin's political economy is forced collectivization of agriculture; politics is very unpopular among farmers and many of them oppose it. In the early 1930's, with the orders of Stalin, millions of peasants were killed or left to die of starvation. And in the end politics is successful. Economically, the agricultural sector may be spelled backward Soviet Union since then. Another is political Stalin rapid industrialization drive. This is partly resolved through a series of "Five-Year Development Plan" which was later copied by many countries outside the Soviet Union. In addition to various non-efesienan, politics industrialization Stalin arguably led to an improvement and success. Despite the magnitude of material loss suffered by the Soviet Union in World War 2, Soviet Union out of the war as the country's second largest industry in the world. August 1939 Hitler and Stalin signed the agreement "not to attack each other" famous. Within two weeks, Hitler invaded Poland from the west, and a few weeks later the Soviet Union invaded from the east side, and occupied part of it. At the end of that year the Soviet Union threatened the independence of three countries: Latvia, Lithuania, and Estonia by force of arms. All three surrendered without a fight and put in the territory of the Soviet Union. Similarly, some areas were included in the Romanian territory. Finland against the threat, but in the end of the Soviet Union invaded and occupied it. The reason the Soviet Union carried out the attack it is because the areas that needed to defend against a possible invasion of Nazi Germany. However, after the war was over and completely defeated the Nazis, Stalin did not release its grip on those areas. (The same has been done by his successors). At the end of World War 2, Soviet Army occupied large parts of Eastern Europe and Stalin used this opportunity to make these areas the Communist state under the influence of the Soviet Union. Marxist government has also appeared in Yugoslavia, but because there are no Russian troops, Yugoslavia is not finished Russian satellite. To prevent any other Communist countries follow the lead of Yugoslavia, Stalin took the security measures necessary. Shortly after the end of World War 2, start the round "cold war" between the Soviet Union and the United States. Despite Truman and the leaders of other Western countries also have a stake in the start of the cold war, there can be no doubt that Stalin's role is greater than them. Month of January 1953 the Soviet government announced that a group of doctors have been arrested on charges of murder against high-level officials of Russia. Stalin seems to be a plan anyway to do the next clearing. However, on March 5, 1953, 73-year-old dictator died in the palace of the Kremlin, Moscow. Stalin's body lay beside Lenin in the Mausoleum in Red Square. However, in subsequent years (especially after Khrushchev's speech of February 1956), Stalin's reputation being dragged down by fierce in the Soviet Union. Destalinisasi implemented on a large scale. Stalin's family life was not too happy and successful. He married in 1904, but three years after his wife died of lung disease. Only child - Jacob - Germany captured the World War 2. Germany made a bid but the offer was rejected the exchange of Stalin, and Jacob died in concentration camps. Stalin married a second time in 1919. This was his second wife died in 1932. There is news of her suicide, but other rumors say that suicide Stalinlah or at least let him get killed. There are two children from this second marriage. His son, an officer of the Russian Air Force, became a drunkard, and died in 1962. His daughter, Svetlana, was expelled from the Soviet Union and in 1967 arrived in the United States. The main character is the cruelty of Stalin. Not the slightest visible compassion, like a hard rock melted. Always in a state of suspicion, close to paranoia. On the other side, he was a very capable: tenacious, strong-willed, steadfast stance, arrogant, and had the remarkable strength of mind. As a dictator for about a quarter of a century, the influence of Stalin had penetrated almost to all aspects of life. Judging from the balance between personal control by the number of people below him and his reign, bisalah considered Stalin was a dictator in the history of the thumb (though debatable Mao Tse Tung also has a strong equal weight). In his lifetime, Stalin sent millions of people into the afterlife, or to forced labor camps. (There is no way of knowing exactly how many people who became victims of the killer broom movement, but may move in sekifar twenty million people). Can not doubt, teramatlah strong short-term effect, but not yet certain how the long term. For example, since the death of Stalin, the iron fetters of the secret police of Russia's population is very much abate. Although the Soviet Union was still behind the United States in terms of political and civil liberties and other democratic countries of Western, now no longer a totalitarian state such as under Lenin period before being replaced by Stalin. Countries of the Soviet satellites in Eastern Europe seems solid, but it is unpredictable how long durability. Many examples in the history of how powerful countries established the country "protector" for his safety under the influence. Generally, countries that are not subordinate to the country so infinite: or he entered fully into the territory of the country that own them, or so free himself. With no visible signs of the Soviet Union would enter them into its territory, it is likely they will be completely free country in this century. (On the other hand, control of the Communist countries like East Germany and Bulgaria will be longer). Expands the borders of the Soviet Union itself under Stalin's rule, although it must be remembered the Russian border is always back and forth over the centuries. Clearly the Soviet Union is now smaller than the Czar of Russia in 1879 when Stalin was born into the world. Stalin is often credited mengindustrialisir Russia. It was the mention of this excess. First, obviously the Soviet Union would make him even without Stalin's industrialization. Second, although Stalin is a figure driving the acceleration of industrialization, he's definitely not a real novice. (Russian Czar in 1914 era is already a fifth of the world's industrial countries). Stalin had an important role in spreading communism throughout the world. This fact contains objective truth. Thanks to the efforts of Stalin Communism is strongly embedded in the satellite countries in Eastern Europe, but in China the hard work done extraordinary Mao Tse Tung is a factor that can not be ignored. Overall I think Marx and Leninlah surely have the biggest stake in the spread of Communism throughout the universe. But, even if Stalin did not parallel its importance compared to Marx, Lenin and Mao Tse Tung, yet can not but he is one of the giants of history, a genius who can not be forgotten that violent history for granted.